We are accompanying James Parton, a well-known author in his day, as he explores Pittsburgh 149 years ago. He has already experienced a day with only about 30 minutes of daylight. Parton’s fame as a biographer would fade with time, but he is about to go to the Hill District where he will be inspired to write one line remembered to this day. There is one evening scene in Pittsburg which no visitor should miss. Owing to the abruptness of the hill behind the town, there is a street along the edge of a bluff, from which you can look directly down upon all that part of the city which lies low, near the level of the rivers. On the evening of this dark day, we were conducted to the edge of the abyss, and looked over the iron railing upon the most striking spectacle we ever beheld. The entire space lying between the hills was filled with blackest smoke, from out of which the hidden chimneys sent forth tongues of flame, while from the depths of the abyss came up the noise of hundreds of steam-hammers. There would be moments when no flames were visible; but soon the wind would force the smoky curtains aside, and the whole black expanse would be dimly lighted with dull wreaths of fire. Two boys enjoy the view of the Strip District from the North Side in 1925, 59 years after Parton viewed it from the opposite side, from the Hill District. That’s a lot of carbon wafting into the atmosphere. It is an unprofitable business, view-hunting; but if any one would enjoy a spectacle as striking as Niagara, he may do so by simply walking up a long hill to Cliff Street in Pittsburg, and looking over into — Hell with the lid taken off. Okay, that’s the line —– Hell with the lid taken off. ‘Hell With the Lid Off to Most Livable’ — How Pittsburgh Became Cool. The story notes that today it’s almost commonplace for sources that bestow best-of titles to home in on Pittsburgh’s finer qualities, giving high marks on everything from bars and ballparks to fun places and real estate prices. It adds that the region repeatedly rates among the best places for brains, roller coasters and robotics, starting a business, buying a house, raising a family, retiring and more. But, some around the country are tired of hearing Pittsburgh gloat about its transformation. They no longer question it’s livability, so they question if it was really all that bad to begin with. They just want to respond to the city’s marketers, so they say Parton’s nighttime description is a love letter to the city — not a criticism. While it is certainly more positive than one might expect, those seeing it as a compliment must not have read much of Parton’s travelogue. If they had, they may have gotten attuned to the subtleties of Victorian sarcasm. Such is the kind of day of which Pittsburg boasts. The first feeling of the stranger is one of compassion for the people who are compelled to live in such an atmosphere. When hard pressed, a son of Pittsburg will not deny that the smoke has its inconveniences. He admits that it does prevent some inconsiderate people from living there, who, but for the prejudice against smoke in which they have been educated, would become residents of the place. He insists, however, that the smoke of bituminous coal kills malaria, and saves the eyesight. The smoke, he informs you, is a perpetual public sun-shade and color-subduer. There is no glare in Pittsburg, except from fire and red-hot iron; no object meets the eye that demands much of that organ, and consequently diseases of the eyes are remarkably rare. It is interesting to hear a Pittsburger discourse on this subject; and it much relieves the mind of a visitor to be told, and to have the assertion proved, that the smoke, so far from being an evil, is a blessing. The benefits of smoke would be seen well into the 20th Century by Pittsburghers. 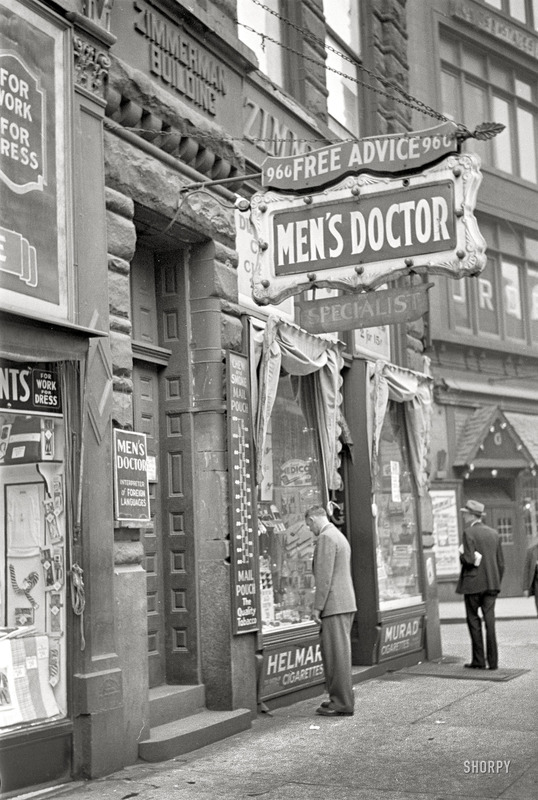 A tobacco shop thrives in 1938 below a medical specialist’s office downtown. Note the Medico pipe rack in the display window. This site was among buildings on Liberty Avenue torn down in 2005. The August Wilson Center is there now. Free advice can be lethal. The Pittsburgh Press reports in its Sept. 15, 1939 edition that a South Side man treated for venereal disease went up to this doctor’s office and shot him to death. He told police the doctor bled him of his money for 15 years, and told him he was cured when he wasn’t. Be sure to click on this photo, and then a second time. It enlarges quite a bit. The really pernicious atmospheres, say the Pittsburg philosophers, convey to man no intimation of the poison with which the are laden, and we inhale death while enjoying every breath we draw; but this smoke is an evil only to the imagination, and it destroys every property of the atmosphere which is hostile to life. In proof of which the traveller is referred to the tables of mortality, which show that Pittsburg is the most favorable city in the world to longevity. All this is comforting to the benevolent mind. Still more so is the fact, that the fashion of living a few miles out of the smoke is beginning to prevail among the people of Pittsburg. Villages are springing up as far as twenty miles away, to which the business men repair, when, in consequence of having inhaled the smoke all day, they feel able to bear the common country atmosphere through the night. It is probable that, in coming years, the smoky abyss of Pittsburg will be occupied only by factories and “works,” and that nearly the whole population will deny themselves the privilege of living in the smoke. With three rivers and half a dozen railroads, the people have ready means of access to places of almost unequalled beauty and pleasantness. Before we leave the Hill District, though, we should visit what is going on there now at the cliff where Parton was so amazed back then. Artist rendition of Cliffside Park set to be completed next year. The iron railing referred to in Parton’s story indicates the overlook was set aside for public use as early as his time. It certainly has been overlooked, but mostly by caretakers. Nature tends to get overgrown there. That is changing. Check the plans here. It is part of a much larger comprehensive plan for the Hill District, one that envisions turning its three distinct neighborhoods into villages surrounded by woodland. Check it out here. We go deep into a coal mine under Mount Washington and talk to Mr. Gallagher, a contented miner. — Parton’s complete Atlantic Monthly article can be read here. — The photo at top of post is not real. It is a composite of a volcano and Pittsburgh smokestacks.